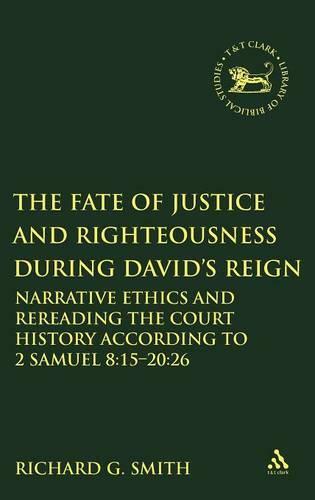 This work argues that 2 Sam 8:15-20:26 is a literary unit designed to show how David and his house failed to establish "justice and righteousness" during David's reign over all Israel. After an introductory chapter and a chapter on critical methodology the rest of the work is a close reading of 2 Sam 8:15-20:26 that pays special attention to narrative ethics. Chapter 3 makes a case for reading 2 Sam 8:15-20:26 as a coherent literary unit reflecting an ethical world-view grounded in kindness and having as its main theme "the failure of justice and righteousness to be established during David's reign." Chapter 4 presents a case for reading 2 Sam 8:15-10:19 as an account of the beginnings of justice and righteousness during David's reign in which David's kindness towards Mephibosheth is presented as analogous to a Mesopotamian royal declaration and wasperformed as an inaugural act of charity upon David's ascent to the throne.